WASHINGTON, D.C., June 29, 2018 — As silicon-based semiconductors reach their performance limits, gallium nitride (GaN) is becoming the next go-to material to advance light-emitting diode (LED) technologies, high-frequency transistors and photovoltaic devices. Holding GaN back, however, is its high numbers of defects. This material degradation is due to dislocations — when atoms become displaced in the crystal lattice structure. When multiple dislocations simultaneously move from shear force, bonds along the lattice planes stretch and eventually break. As the atoms rearrange themselves to reform their bonds, some planes stay intact while others become permanently deformed, with only half planes in place. If the shear force is great enough, the dislocation will end up along the edge of the material. The researchers used computational analysis via molecular dynamics and density functional theory simulations to determine the structural and electronic properties of a-type basal edge dislocations along the direction in GaN. Dislocations along this direction are common in semipolar growth orientations. 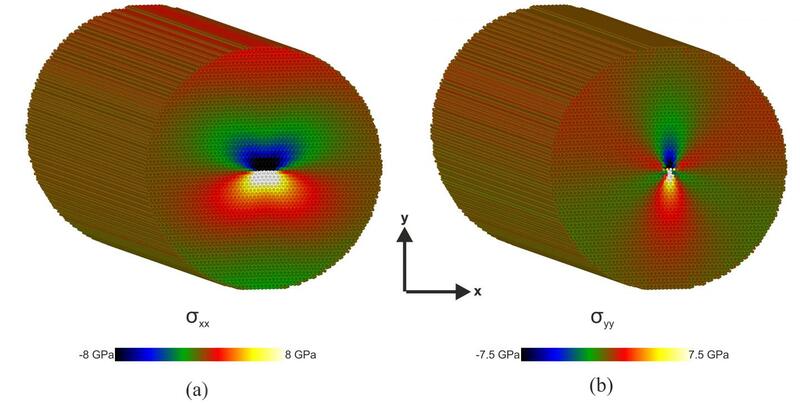 The article, "Structural and electronic properties of a-edge dislocations along in GaN," is authored by Stefanos Giaremis, Philomela Komninou, Imad Belabbas, Jun Chen and Joseph Kioseoglou. The article appeared in Journal of Applied Physics June 26, 2018, (DOI: 10.1063/1.5034198) and can be accessed at http://aip.scitation.org/doi/full/10.1063/1.5034198.